I once sat around a table with senior U.S. brass from Audi and was laughed at for asking if the brand would ever introduce a drift mode like many of its rivals. Well now rumors and teases indicate Audi will instead offer an R8 that’s always in drift mode with a rear-wheel drive model. Who’s laughing now? No one is, I just wanted to sound tough. 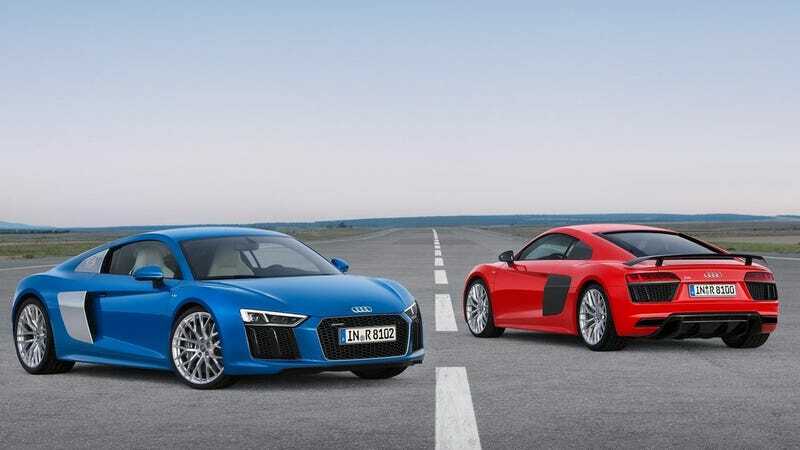 Anywho, Audi might reveal a RWD Audi R8 at the Frankfurt Motor Show, which would likely serve as the new entry-level model. If the first R8 was a gate-shifted AWD homerun, the second-gen R8 is trying to do just about everything the first one didn’t. This is fine! There’s plenty to get excited about with a RWD-only Audi R8, including things like burnouts and drifts and all of that madness. But part of me can’t help but think the only thing separating Audi’s R8 and Lamborghini’s Huracan now is whether you’re a high-profile modernism architect or the high-profile son of a high-profile modernism architect. Audi’s thing is AWD. That should be the specialty and appeal of an Audi supercar. Now that’s partially diminished with a RWD model. You could have accomplished the same thing with, I don’t know, a button that would let your AWD model send more power to the back wheels. Kind of like a drift-mode, huh? What's an Audi and what's a Lamborghini these days, anyway?